IAM Lodge 778 sponsored a special commemorative event as part of a National Day of Remembrance to honor America’s nuclear weapons workers that includes IAM-represented workers at the Honeywell FM&T plant in Kansas City, MO. Approximately 500 former and present workers and their family members, as well as federal, state and city officials attended. 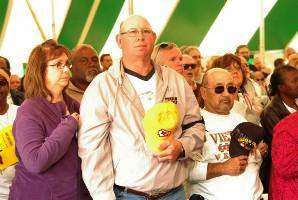 Nearly 500 former and current workers from the Honeywell FM&T plant in Kansas City, MO, took part in an event sponsored by IAM Local 778 to honor the nuclear weapons workers at the facility. The workers were joined by friends, family members as well as federal, state and city officials. The ceremony included an Honour Guard, Taps, Rifle Volley, worker procession, floral wreath, tree dedication and much more. The Ruskin High School Band and Choir also performed. A candle light solidarity rally in conjunction with National Day of Remembrance for Nuclear Weapons Program Workers was held later in the evening. The purpose of both rallies was to recognize the sacrifice made by current, future and past workers in the nation’s nuclear weapons program. The U.S. Senate has recently unanimously approved a Senate Resolution, designating a National Day of Remembrance for All Nuclear Weapons Program Workers. The rally also brought attention to the current work stoppage at the Honeywell Kansas City Plant, and the workers’ determination to maintain access to affordable health care now and in the future.